Preface. 1. Culture and the Socioeconomic Management Models of Our Time. 2. Management and Power. 3. 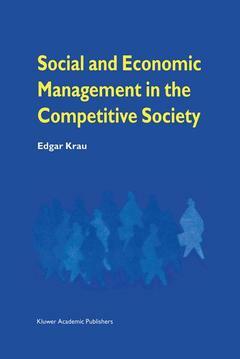 Management in Collectivist-Authoritarian Societies: Legacies of the Past Make Their Way Into the Future. 4. Competition on the Loose in Liberal-Individualistic Societies. 5. Collectivist Societies with Participation in Decision Making. 6. Cultural Pluralism within an Individualistic Society: The Crystallization of a European Socioeconomic Model of Strategic Management. 7. Socioeconomic Management and the Immigrant Question: Are Immigrants a Threat to the Well-Being of the Host Society? 8. Managerial Thinking Should Include Organizational Careers. 9. Where Does the Future Lie? References. Subject Index. About the Author.